Want to see the San Francisco Bay as the sun sets over the Pacific Ocean? This 1.5-hour Sunset Sail is for those who want a serene, romantic experience—it’s the perfect date night! Relax and sip some California wine in our protected cabin with intimate tables and cushy seating. Whether you live in the San Francisco Bay Area or are visiting from out of town, there is no better way to see San Francisco from the bay. 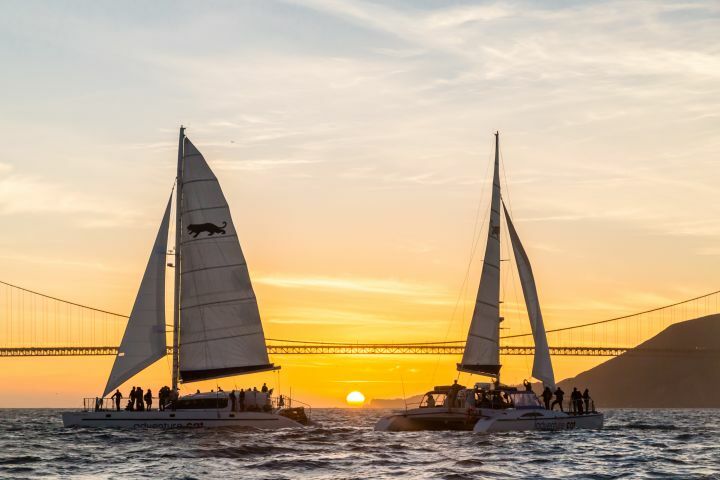 Adventure Cat Sailing Charters offers a relaxing sail that takes you from the famous Pier 39, around Alcatraz Island and under the Golden Gate Bridge to watch the Sunset in the Pacific Ocean. Watch the city slowly light up behind you as the Golden Gate bridge glows in the dwindling sunlight. Relax and sip some wine in our protected cabin with a 360 degree views with intimate tables and cushy seating or hang out on the netting where you can watch the water underneath you. Included with your ticket are two complimentary beverages (beer, wine or soda) from our bar and light hors d’oeuvres. It’s a memorable night out that won’t break the bank! When it is time to board the Catamaran, the friendly Adventure Cat Crew will greet you at Pier 39, Dock J to check you in. You will then be able to board either our 55 or 65 foot catamaran to sail off into the Bay! Arrive 30 minutes early to find parking and check-in as Adventure Cat departs right on time! Wear comfortable clothing and dress in layers! If you forget your jacket, no worries Adventure Cat is happy to let you use one. Two complimentary drinks and hors d’oeuvres are included (Outside food and beverages are not allowed). Audio tour is available in English, German, French, Mandarin, Italian, Portuguese, Spanish, and Korean.